Elegantly presented, this is an old-school ECM style release with no booklet notes, just some photographic insights into the recording sessions. With the music thus allowed or obliged to speak for itself, it’s easy to get straight down to the heart of the business. Keith Jarrett has recorded a fair amount of ‘classical’ repertoire, but it has been over 15 years since he recorded some Mozart concertos for ECM in 1996 and his previous solo Bach recordings mostly date from the 1980s. He also made a very good recording of the 3 Sonaten für Viola da Gamba und Cembalo with Kim Kashkashian in 1991. 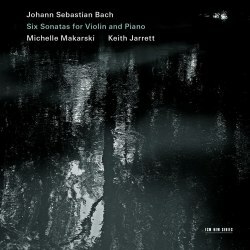 Michelle Makarski has been a friend of Jarrett’s for many years, and they would often play these sonatas for their own pleasure. The warmth and amicable nature of the playing in this recording is no doubt a result of these musicians’ familiarity with the works and with their own responses. All technical issues are swept aside in fine music-making, even in really tricky movements such as the first Allegro of BWV 1017. Makarski’s fairly silvery tones contrast with a nicely rounded piano sound to create an airy but direct effect which makes no moves towards added or artificial profundity. Snappy tempos arise in movements such as the final Allegro of BWV 1014, but the more reflective movements have a rhythmic elasticity which is quite compelling. Jarrett’s colour and relaxed weight of touch at the keyboard keeps everything transparent without becoming precious and fragile, and Makarski’s melodic phrasing, dynamics and articulation are usually very refined. She performs with a restraint in vibrato which on occasion leans towards ‘authentic’ Bach, but she keeps plenty of life in the sound, responding to Jarrett’s unpretentious playing with an equality of expression which makes for very satisfying listening. If I have any criticism of the recording it might be the volume of the violin against that of the piano, a subjective feeling which probably has as much to do with contrast in timbre as actual sound levels. The two instruments are balanced well enough, but a smidge more presence in the piano or a centimetre or so more distance between violin and microphones would have helped - at least that’s the impression I have through my admittedly punishingly analytical headphones. Veteran speakers push this issue onto the back burner, which is why I’m prepared to place it in the subjective and personal perception category. This is a recording full of gems and joys, and I would recommend it wholeheartedly. Of the alternatives in this set of sonatas there are of course a dizzying selection of versions with violin and harpsichord, and not very many with piano - on which I based all my comparisons. Yehudi Menuhin’s elderly set with Louis Kentner and Wanda Landowska on EMI falls into the historic mixed-bag category, and as you might expect, Glenn Gould’s Bach piano playing is incomparably individualistic, so his remarkable recording with violinist Jaime Laredo on Sony Classics comes in a special category all of its own. You can hunt around for Victoria Mullova and Bruno Canino on Philips, but this is a deleted title and not a complete set in any case. Frank Peter Zimmerman & Enrico Pace have a DVD version out on Medici Arts which I haven’t heard but seems worth looking into. In other words, to my surprise it would seem Makarski and Jarrett find themselves CD market leaders in violin/piano BWV 1014-19 by default, but considering the quality of their performances this is a deserving No. 1 spot. Market leaders by default, but very fine as well.